Not being content with just a boring old hat for the school Easter parade, my kids wanted something a little more fancy, and a lot more crazy. So of course I was up for the challenge, and we made these fun printable Easter glasses! We made one pair of Easter egg glasses, and one pair of Easter bunny glasses. 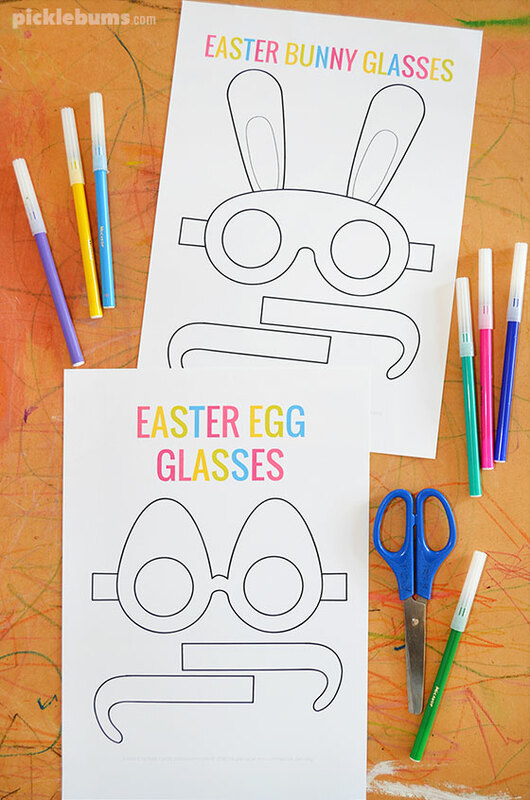 Both pairs of glasses are the perfect accessory for an Easter hat parade, and a fun activity to keep the kids busy over the Easter weekend. Our Free printable Easter glasses templates (see below). Something to decorate your glasses with. To make your Easter glasses, print out the template you choose onto sturdy card. 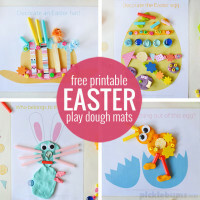 Or print it onto regular paper and glue it onto an recycled cereal box. Now cut out the three pieces, carefully cutting out the eye holes by making a small snip in the centre and then cutting the large hole. When all the pieces have been cut out, fold over the flaps at the end of the arms and tape or glue them to the frames of the glasses. The glasses are sized to fit medium sized heads. If the wearer has little head simply shorten the arms by folding over a little more at the end and trimming off the extra. If the wearer has a particularly big head you might need to cut out the arms with a little extra length added. Now it’s time to decorate your glasses! We used markers, sequins, and a little glitter. You could use collage materials, stickers, watercolor paints, washi tape, crayons, or anything you like! 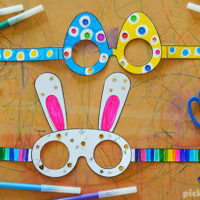 You could also add coloured cellophane so that you can see the world through ‘Easter-coloured’ glasses! 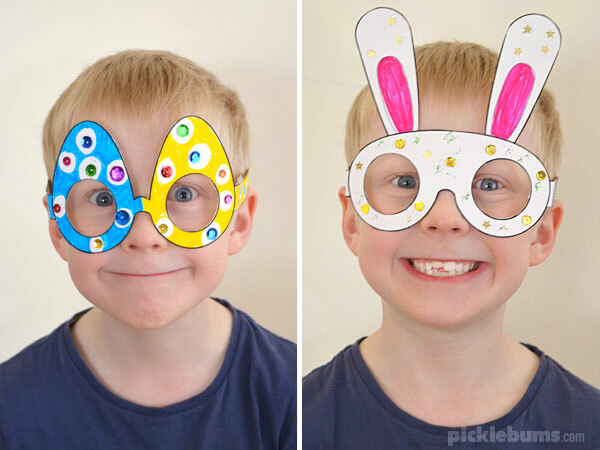 Now all you need to do is try on your crazy fun Easter glasses! If you’d like to make some fun free printable Easter glasses, you can download the templates below. You can download the free printable egg glasses template here. 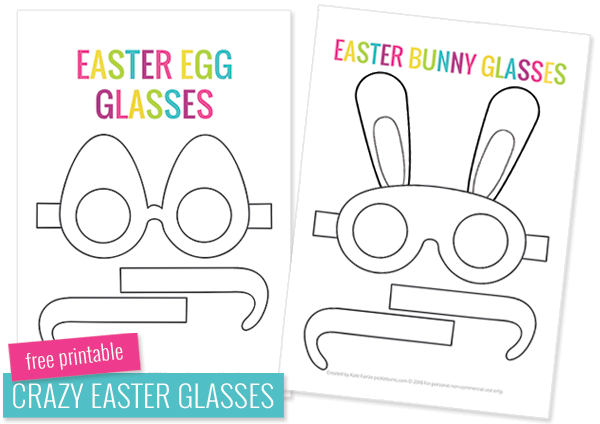 You can download the free printable bunny glasses template here. 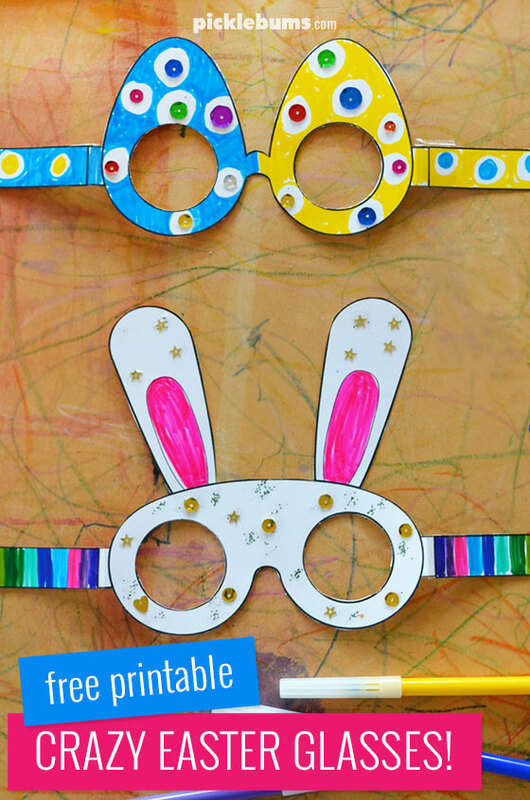 How will you decorate your fun and crazy printable Easter glasses? 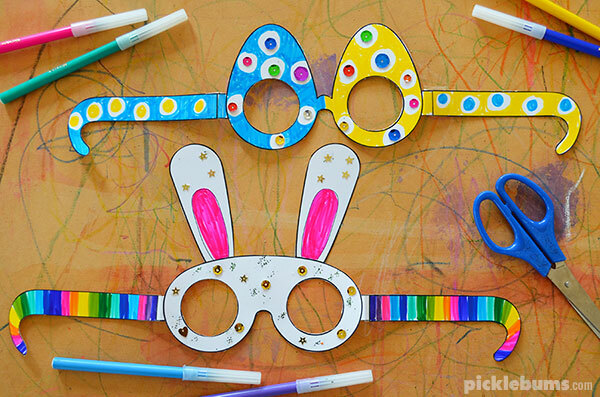 Are you going to make some crazy Easter glasses? We’d love to see a photo if you do! Share a photo on instagram and tag us – @picklebums – or use the hashtag #picklebumsprintables so we can check it out. 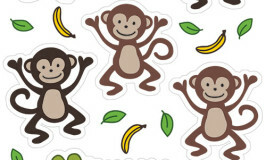 Click on the links under the image of the printable and save the pdf files to your computer. You’ll need adobe acrobat (or another compatible pdf reader) to open the files (you can not open them in graphics editing software) and you can print them from the pdf reader. I love the glasses idea!!! I will do it with my group and share with you! tks a lot! Wow this is brilliant! Thank you so much for putting this together! So very cute! 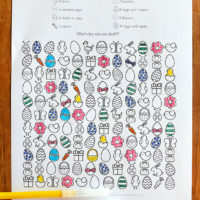 We will do this with the kids when we are dyeing eggs this weekend! Thanks for the printables!